SADC, the 14-country Southern African Development Community, has said NO to hosting the US Africa Command, as Defence Minister Mosiuoa Lekota said on Wednesday. There is broad consensus among African countries that foreign forces – specifically in the form of the United States’ new African Command – would not be welcomed to establish themselves on the continent. Defence Minister Mosiuoa Lekota expressed this sentiment Wednesday . . .
. . . Africa has to avoid the presence of foreign forces on her soil,” Mr Lekota told reporters on Wednesday. “If there was to be an influx of armed forces into one or other of the African countries, that might effect the relations between the sister countries and [would] not encourage an atmosphere and a sense of security,” he added. In reply to a question as to whether this decision had been communicated to the United States, he indicated that a decision made by the continental body, the African Union (AU), would likely be communicated by the Addis Ababa administration through the relevant channels. This is very good news. This is a NO to occupation, recolonization, and imperialism. It is still not a big enough no, but it is a step in the right direction. And it makes things a little more difficult for any other country to host Africom, or any who might be enticed in that direction. The following comment provides more detail, so I have copied it into this post. The Zambian government has turned down a request by the United States to establish a military base in the South African country. “As Zambia, we will not be giving sanctuary and I think I can speak on behalf of the SADC region that none of us is interested,’ said President Mwanawasa, while rejecting United States’ plan to establish a military base in his country. no word on zambia’s previous agreements to allow u.s. military planes to refuel at zambian airfields (“lily pads”) or its partner status in the u.s. ACOTA and IMET programs. Full spectrum dominance is not the method of a democracy. Full spectrum dominance IS imperialism. It is at direct odds with democratic principles. When a country espouses democracy, this should be the approach of last resort, if at all. It may be an appropriate approach for a military organization. The military has a more narrow and specific mission. However, the US has a civilian government. A democratic government should avoid wars when possible, and only engage as a last resort. Although it has migrated away from democratic institutions and principles, the US still preaches democracy. With luck it will alter its direction and return to democratic principles. It still has the tools. The military needs to support and uphold the principles of democratic government, at home and around the world. “Full-spectrum dominance” is the key term in “Joint Vision 2020,” the blueprint DoD, Department of Defense, will follow in the future. In fact Joint Vision 2020 involves the dominance of space. Control of Space (CoS) is the ability to ensure un-interrupted access to space for US forces and our allies, freedom of operations within the space medium and an ability to deny others the use of space, if required. Global Engagement (GE) is the combination of global surveillance of the Earth (see anything, anytime), worldwide missile defense, and the potential ability to apply force from space. 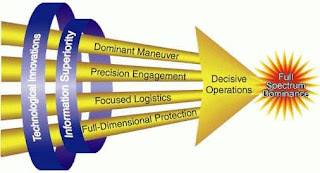 Full Force Integration (FFI) seamlessly joins space-derived information and space forces with information and forces from the land, sea, and air. Global Partnerships (GP) augment the military’s space capabilities by leveraging civil, commercial, and international space systems. This operational concept results from the explosive growth of commercial and international space capabilities. After reading this I thought that for the military, full spectrum dominance is the obvious goal in any military scenario. The problem is that the present US government, the Bush administration, sees every scenario as a military scenario. A military approach or “solution” should be the last resort. For Bush, it is the first choice. And full spectrum dominance is not just about scenarios, it is about controlling the whole globe, imperial control of the whole world, from and including space. The Bush administration has been following an economic policy designed to make the US the economic equivalent of Argentina in the 50s and 60s, spending huge amounts of borrowed money that do not contribute to increases in productivity or infrastructure, a rich country making itself poor. The result has weakened the country and severely weakened the military. The Bush war on science has damaged the US scientific and technological edge. The stature of the US as a global leader has been severely damaged by the unprovoked occupation and destruction of Iraq. And because of all the money wasted in Iraq, the US is farther away from any positive accomplishment or constructive goal. The US needs to find a political solution to its relationship with just about every country in the world. And it needs an internal political solution to its own dreadful behavior. Because of oil, and a number of other extractive resources, but mostly the oil, the US has set its sights on full spectrum dominance in Africa. At the same time celebrity condescension and “humanitarian” ad campaigns portray Africans as afflicted and helpless. By painting Africans as people unable to help themselves, the celebrity humanitarian narrative, and the media attention it gets, make it much easier for nations, specifically the US, to engage in imperial acquisition in the name of humanitarian aid and development. And that is exactly the purpose of the Africa Command, and why it keeps describing itself in terms of diplomacy and humanitarian aid. (Pay no attention to the fact that by pouring arms into Africa throughout the cold war, and by backing terrorist organizations in Africa, the US contributed more than its share to the destabilization and suffering in many African countries. This continues through the present. Those days are gone, as a friend says. Although the US can, and it looks like it plans to, make things very unpleasant in the short term. African countries now have people who can and will push back effectively. To see a few of these people, and a more positive and productive vision, check out TED Global 2007 (TED = Technology, Entertainment Design) and listen to some of the speeches by Africans at TED Themes – Africa the next chapter. I’ll probably write about these again. August 14, 2011: To date President Obama has continued and expanded these Bush policies, and has expanded the ongoing militarization of Africa through the Africa Command. In Ramblings of an African Geek, Kwasi provides as neat and clear an explanation of the background and the issues of ODF and OOXML for Ghana and other developing countries as I have seen anywhere. The International Organization for Standardization (ISO) will be voting on this September 2, so it is currently a matter of interest and importance. I’ve included an excerpt, but it is worth reading the whole article, particularly if you may need to explain some of this at some point, or have the opportunity to ask questions. Developing countries are still building the vast majority of their IT infrastructure. This means that they do not have a massive base of old documents in a restricted format. Those documents are on paper. Their offices are still being computerized. Their people are still learning how to use those computers. If you are going to teach someone to use an office suite anyway, what difference does it make if that suite is MS Office, Openoffice.org or Google Writer? 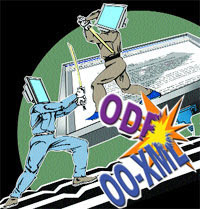 What difference does it make if those legacy paper documents go to ODF or OOXML? Either way the work has to be done and the money has to be spent. The problem is, what happens when you lock yourself into a company’s proprietary format because they are giving you free stuff and claim the format is open, then they start charging you for it and you realize all those alternatives they assured you existed can’t fully open your documents and you are stuck with them and their licence fees? Problem: At this point in time Africa is overwhelmingly a consumer of other people’s ideas and technology. Well, it isn’t if we have no issues with playing in second place for all time. Assuming we have a problem with that though, we will not achieve parity while we are dependent on outside brain power to solve all our problems while we sideline local talent and ability. How does the Open Source movement help us to address this? The free flow of information gives us a huge chance to level the playing field. Lowers the barriers of information access. Gives us a look at their tools and their processes. This we can use to leverage those tools as we use them, and to create our own. In other words, this is about more than just getting cheaper consumer goods. Its about contributing back to the global share of information as equals. India and Brazil have indicated they will vote in favor of ODF rather than OOXML. And Slashdot has a number of articles with good discussions in the comments. Two of them are here and here. Blade Nzimande, general secretary of the South African Communist Party, issued a statement Aug. 14 calling upon progressives to study, discuss and oppose the “brazenly unilateralist” project. Under the guise of the War on Terrorism, the U.S. government has moved forces into various parts of Africa, where they were able to train African armies and to intervene in the increasingly dangerous resource wars. For a time the African Union was able to stabilize the situation, although it did not succeed in crafting a political solution to the problem. The African Union, created in 1999, has neither the financial ability to pay its troops nor the logistical capacity to do its job. The European Union, who paid the troop salaries, began to withhold funds on grounds of accountability, and it gradually killed off the peacekeeping operations. . . . “There is a concerted attempt being made to shift the political control of any intervention force inside Darfur from inside Africa to outside Africa.” In other words, the U.S. and Europe are eager to control the dynamic of what happens in Africa and not allow an indigenous, inter-state agency to gain either the experience this would provide or the respect it would gain if it succeeds. The African Union has been undermined so that only the U.S. can appear as the savior of the beleaguered people of Darfur, and elsewhere.
. . . neoconservatives now seem to embrace aggressive and unilateral intervention in foreign affairs. The Economist has a rather nice article about investing in Africa this week, The sunny continent. It is mostly about two businessmen, Mo Ibrahim and Sam Jonah, and their thoughts and plans about the future. Mr Ibrahim . . . is ebullient about the potential for mobile phones and mass entrepreneurship to deliver even more dramatic growth and poverty reduction in future, in Africa as well as elsewhere. He recently established a $150m fund to invest in African business. Mr Jonah is a larger-than-life hail-fellow-well-met Ghanaian, who made his first fortune by selling Ashanti Goldfields, a Ghanaian mining company, to South Africa’s mighty AngloGold . . . He is now doing well in private equity. As evidence of his bullishness, Mr Jonah is trying to raise $250m to build long-distance roads across Africa—the lack which is one of the most obvious failures in the continent’s infrastructure. His goal is to find 50 successful African business people, each willing to invest $5m in the fund, and then to use multilateral funds to leverage the money into the billions. There is increasingly a pro-African mood in the global business community nowadays, says Mr Jonah. This is where Mr Jonah and Mr Ibrahim are somewhat at odds with each other. Last year Mr Ibrahim endowed an annual prize for leadership in Africa, which will recognise a retired African leader who did a good job in office. Mr Ibrahim, one of Africa’s first home-grown philanthropists, believes this prize will help raise the standard of leadership across the continent. I have read elsewhere, I think it might have been in the Wall Street Journal a few years ago, that if Africa had received the same kind of investment eastern Europe did after the fall of the Berlin wall, there would have been even more to show for it. The United States has mostly engaged in military assistance, that has destabilized and impoverished its targets. Many of the top U.S. arms clients –Liberia, Somalia, the Sudan, and Zaire (now the Democratic Republic of the Congo or DRC) — have turned out to be the top basket cases . . . in terms of violence, instability, and economic collapse. The US is always claiming to be businesslike. It should act a bit more businesslike. Business investment can have its downside, think Enron as just one example, and some of my friends think Jonah is a crook. I know very little about Ibrahim. But both men are on the right track in what they are saying. I hope the optimism and investment continue and pay off. The Economist has an article this week in which it points out that power shortages are one of the biggest brakes on development. 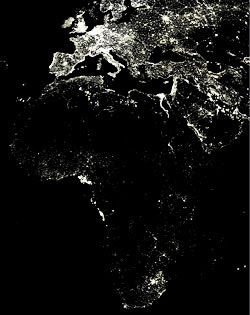 SEEN from space, Africa at night is unlit—as dark as all-but empty Siberia. With nearly 1 billion people, Africa accounts for over a sixth of the world’s population, but generates only 4% of global electricity . . . most of the attempts at electrification in the 1970s and the 1980s failed. In some countries, dictators pillaged power stations for parts and fuel. In others, power stations were built but not maintained. Turbines were run at full capacity until they broke, then were abandoned. By some counts, only 17 of Nigeria’s 79 power stations, many dating from this period, are still working; . . . The World Bank reckons that 500m sub-Saharan Africans are without what it calls “modern energy”. Many African governments are looking at alternative sources of energy to make up their projected shortfalls. Hydropower is clean, from the point of view of greenhouse-gas emissions, but most of the easy alternatives, notably coal, are dirty. Donors committed to cutting global carbon emissions are unlikely to favour more dirty coal-fired power stations of the sort that predominate in South Africa, although the government there claims that it wants to clean them up. Some fossil fuels, however, are less damaging than coal. A pipeline planned for west Africa, which will carry gas that is now flared off in oilfields, could stabilise electricity supply in coastal cities. Few Africans in rural areas have access to electricity. Connecting them to national grids will be slow and expensive. Yet Lilliputian windmills, water mills, solar panels and biomass furnaces could have a big collective impact. The cost of lighting a shack takes 10% of income in the poorest households and the kerosene lamps are highly polluting. In response, the World Bank has rolled out “Lighting Africa”, an ambitious effort to get 250m of the poorest Africans on clean-energy lighting by 2030. Talk of the mass production of biofuels in Africa is premature, but advances have been made. Some investors are backing jatropha, a plant whose seeds produce an oil for burning in generators. There is also an effort to tap geothermal energy. The Great Rift Valley, from Eritrea to Mozambique, could produce 7,000MW. Kenya hopes to get 20% of its energy from geothermal sources by 2017. Engineers think they can also use the steady winds in Africa’s mountain ranges for power production. And if the costs of using the sun’s warmth can be reduced to 30% below its present cost, vast solar farms could offer cheap, clean energy for African cities and in doing so boost incomes in rural areas. Egypt, which relies mostly on natural gas, is looking hard at solar power. The biofuels worry me a bit. If Africa goes into biofuel production, will it be for African power? or for US and European use? Much of what I’ve been reading lately talks about Africa growing biofuel for the US market. And although this article talks about how hydropower is clean, it can still have profound environmental impact, which is not mentioned here. We can see examples of this with the Chinese dams on the Mekong, and the consequent effect on water supply in Southeast Asia. Small scale local projects can make a huge difference. I was relieved the article did not mention nuclear power. Some are talking about that, and it would be an unmitigated disaster. No one has figured out what to do with nuclear waste. It is a huge, though mostly silent problem in the US. Europe has been dumping nuclear waste off the coast of Somalia, some of which washed up with the tsunami. And the regulation and management, which is unreliable here in the US, would, depending on which government in which country, be likely to be less dependable, more erratic, and a danger to everyone. ADDED 8/23 – After studying the map above, it looks like the brightest spots are Cairo, the Niger Delta, and Pretoria. Everything I read about the Niger Delta says there is little to no electricity, and what there is, is frequently off. So what is causing the light? Other things I read say that you can see the fires from space that flare the gas off the oil, and that there are children in the delta that have never known a dark night. Is the light coming out of the Niger Delta from gas flares? 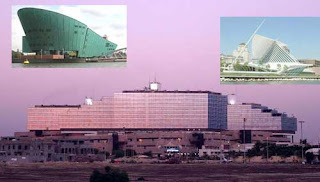 US Embassy in Ethiopia – shaped like a ship? Ethiopia is a landlocked country. And yet the US is planning to build a huge new embassy there in the shape of a ship. The United States (US) government is soon to erect perhaps its largest single structure in Africa, in the compound of its Embassy in Addis Ababa . . . the four-story building is projected to consume a total investment of 140 million dollars. The four-story building, depicting a ship, will be erected right in front of his (the ambassador’s) residence, on the vast green area. It will serve as offices to the various bureaus the Embassy has inside the compound. US builds a new embassy in Ethiopia in the shape of a ship. The US Navy will play a major part in the new US Africa Command. As reported in a comment: Ethiopia desperately wants a coastline & the U.S. probably wants them to have it too. Ethiopia shares borders with both Somalia, and Eritrea, both of which have coastlines. 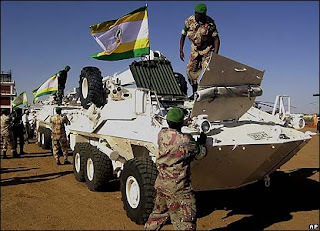 Ethiopia recently invaded Somalia with US assistance, allegedly to root out terrorists. The US is talking about designating Eritrea as a state that sponsors terrorism. Is the US planning interventions and more regime changes in Africa? Do the US accusations of terrorist activities have anything to do with terrorism, or are they about something else?